Hotel Muse Bangkok is renowned as one of the best hotels in Bangkok. This elegant boutique Bangkok hotel was inspired by the grand designs of 1920s Europe, and is enlivened by touches of contemporary Asian décor. This skillful recreation of the style, ambience and decadence of the ‘golden age of travel’ has ensured that Hotel Muse Bangkok’s is now known as one of the best hotels in Bangkok. 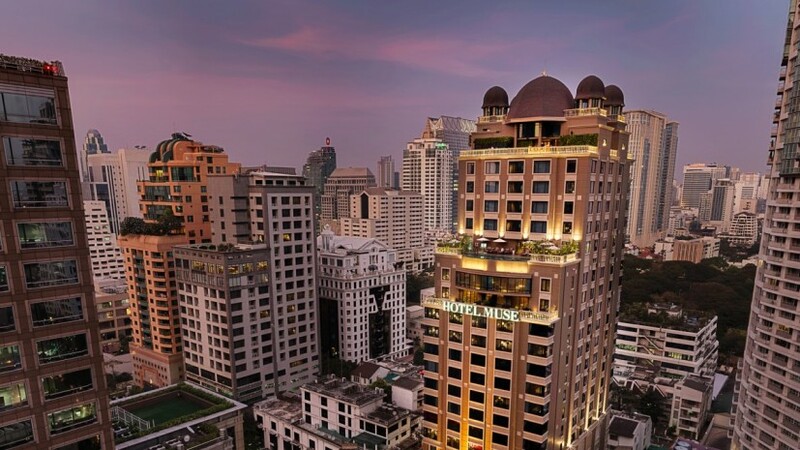 The location setting, architecture and boutique style of Hotel Muse Bangkok are just a why our hotel are the best choice for your holiday in Bangkok, add in the ultimate grand breakfast, the swimming pool with fantastic skyline views, complimentary Tuk-Tuk shuttle, the service levels are on par with the best hotels in Bangkok. A member of MGallery by Accor, a collection of exceptional hotels noted for remarkable vision, design, and history, Hotel Muse Bangkok is the recipient of numerous international awards that have further its reputation as one of the best hotels in Bangkok. Prestigious accolades include Condé Nast Johansens 2018 in the “Best for Luxury Value” category. Winning the coveted award is particularly meaningful as votes are based on responses from online voting, guest feedback, and local expert reports drawn from the hotels featured in Condé Nast Johansens most recent guides. Another award that has helped Hotel Muse Bangkok become known as one of the best hotels in Bangkok was it triumphs at the Haute Grandeur Global Hotel Awards, scooping “Best Romantic Hotel in Asia 2017”. The awards are recognized as the highest accolade in the hotel and spa industry. Winners are those hotels and spas that set themselves apart through excellence on all level, offering inspiring guest experiences that are incomparable and truly memorable. As one of the best hotels in Bangkok, Hotel Muse Bangkok was also the recipient of a Seven Stars Luxury Hospitality and Lifestyle Award 2017 which is considered the pinnacle for luxury hospitality and lifestyle hotels and products worldwide. Hotel Muse Bangkok has created a unique ambience for lovers seeking a truly memorable and luxurious getaway in one of the best hotels in Bangkok.